ON O‘AHU, KAUA‘I, MAUI, AND MOLOKA‘I, chemical and biotechnology companies Monsanto, Syngenta, DuPont-Pioneer, Dow Chemical, and BASF have purchased prime agricultural land, taking advantage of Hawai‘i’s isolation and year-round growing season, in order to field test crops that have been genetically engineered (GE) to withstand greater applications of pesticides. 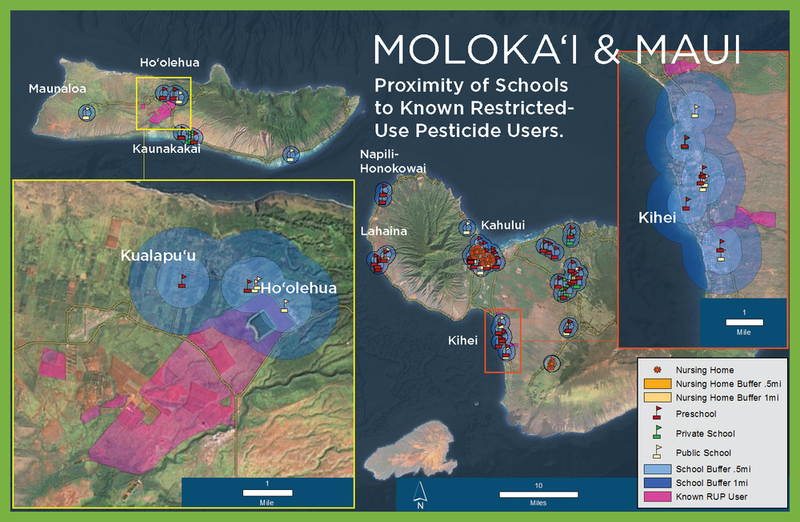 As the report details, the onslaught of pesticide-promoting GE crops on the Hawaiian Islands raises three main areas of concern: the impacts of pesticide exposure on public health, the threat to native biodiversity, and food independence for the people of Hawai‘i. The seed industry’s footprint (24,700 acres) is 72% of the total area planted to crops other than sugarcane or pineapple (34,400 acres). Since 1987 Hawai‘i has hosted more cumulative field trials (3,242) than any other state. Herbicide-resistance was the most frequently tested trait in GE crop field tests in Hawai‘i over the past five years. This means that plants genetically engineered in Hawai‘i, by and large, are engineered to resist the greater and greater application of herbicides. DuPont-Pioneer applied 90 different pesticide formulations containing 63 different active ingredients on Kaua‘i from 2007 to 2012. Many residents, including children, have complained about sickness they attribute to pesticide drift. EPA requires safety testing only on the pesticide product’s active ingredient, even though “inert ingredients” in pesticide formulations can be toxic in their own right, or increase the active ingredient’s toxicity. Despite claims that the seed industry is a pillar of Hawai‘i’s economy, it only employed 1,397 workers in 2012, representing just 0.23% of total Hawai‘i jobs. In 2014 alone, Hawaii had over 6 times more GE crop test sites than California. The vast majority (91%) of the plants being tested are corn and soy—not niche crops such as papaya or banana. The company sprayed on two-thirds (65%) of the days over this period and made from 8.3 to 16 applications per application day on average. In general farmers, farmworkers, pregnant women, and children are at greatest risk: farmers are more highly exposed than the general population; and children are more susceptible to the harmful effects of pesticides than adults. As of 2014, at least nine states had established no-spray buffer zones around sensitive areas such as schools, hospitals, and public parks, while eleven states have established notification requirements for pesticide applications near schools. These policy actions evince growing awareness of the serious health threats posed by pesticide drift.